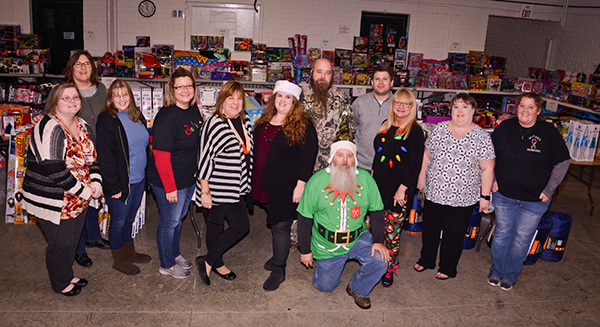 PIKETON, Ohio – For seven years in a row, volunteers from Fluor-BWXT Portsmouth (FBP) have joined Pike County Children’s Services and other organizations to help distribute gifts for children to families in need. Approximately 330 families signed up for the program in 2017, which resulted in Christmas presents being given to more than 800 children. Through their Community Commitment Fund, FBP donated $10,000 to the program to purchase gifts. In order to be eligible, qualifying families must register in advance. On their assigned day, parents line up on the sidewalks outside the Pike Christian Academy High School, sometimes waiting for hours in the cold to ensure they’ll have gifts for their children on Christmas. When it’s their turn, patrons browse the aisles of toys and clothes that have been neatly organized inside the high school gymnasium. Many of the recipients are working families, with nothing left to spend on Christmas after paying rent and other bills. Community Relations Specialist Deneen Revel, FBP, looks forward to helping with the event. Volunteers at the event get to help needy families select presents for their children to open for Christmas. Phyllis Amlin-Snyder, co-chair for the Pike County Children’s Christmas Fund, is thankful for the donations and for the volunteers who have made the fund successful. Each year, volunteers from General Electric offer refreshments, including hot chocolate and coffee to patrons while they wait. The program has been in existence for 30 years. Children’s Services’ and Pike Community Action Inc. combined resources and have been in charge of the program for the past 13 years. Other than the gifts that are donated, the staff picks out all of the presents. Tina Long is one of the helpers. “In the fall, we start getting the older kids’ stuff because there’s more of a selection for the different things that we buy. We take great pride in picking out the presents for them,” Long said. “Everything is in bags marked by age group. When we check out at the store, Tina’s right there with me with the big bag and she marks it with a marker so that when we come over here, they’re unloaded into their spaces. We started at 8:30 this morning to bring things over and we were finished by noon, so we really do have it down to a science,” Amlin-Snyder said. In addition to toys, clothing and wrapping paper that were donated, there were 50 winter coats and more than 350 turkeys/hams available to families. 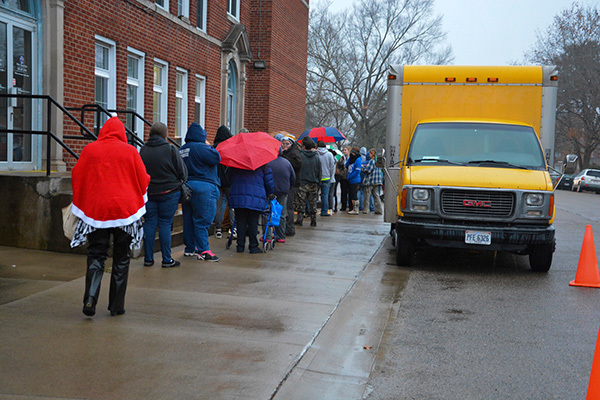 Extra turkeys and hams were donated to the area food pantry and the Disabled American Veterans office in Waverly. The two-day event was held Dec. 18 and 19 at Pike Christian Academy High School, in Waverly. Fluor Corporation (NYSE: FLR) and BWX Technologies, Inc. (BWXT) (NYSE: BWXT), two world-class companies with significant Ohio experience, formed FBP to address the decontamination and decommissioning (D&D) needs at the Department of Energy’s (DOE) Portsmouth Site in Pike County, Ohio. CH2M, another global leader in industrial and environmental projects, provides support. Fluor-BWXT Portsmouth employs 1,900 workers who bring unparalleled experience, insights, and lessons learned from across the DOE complex. The FBP mandate is to clean up the Portsmouth Site safely and compliantly, provide strong uranium stewardship and partner with local communities to achieve a sustainable economic future. For more information, visit www.fbportsmouth.com. A long line of patrons forms outside Pike Christian Academy’s high school building.